I can hardly believe that it's June already. Lots of things happened this week, in preparation for our Beads of Courage Colour run. We had a table at the SaskMarathon expo again this year to share about the Beads of Courage program in Saskatchewan. 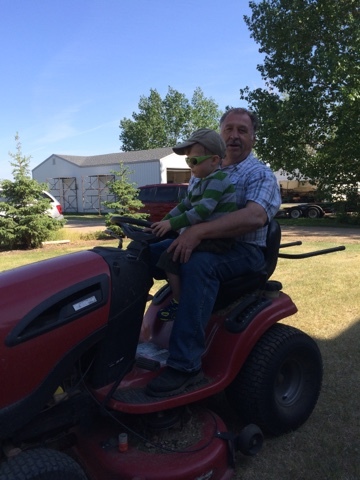 B-rad and I took the boys out to his parents acreage to let Chewie practice riding his bike. Meanwhile, Grandpa let Artoo drive the tractor! On Sunday my friend Tara and I ran in the SaskMarathon 10K. Our run started at 8:10, so i picked Tara up at 7. I set my alarm that morning for 6AM and 6:15AM (yes, i set 2 alarms) but i didn't need either of them because i was awake at 4, and then every 15-20 minutes after that until i just got up. The run was super fun and challenging. almost at the finish line!!!! munching on my medal, as you do. Our official chip time was 1:19:03, which was 8 minutes faster than the last 10K we did. So, go us!! I am so tired and exhausted though. Weekly Challenge #220: "UMT: All Boxed UP by Alice Hendon, CZT"
I really love the versatility of this tangle. Alice has lots of different variations of this tangle on her blog, so be sure to check that out. I like the randomness of your boxes. Best to you and your family. I always like to read your weekly blog and you are fantastic parents. Congratulations; you did it again!!!!! Nice tangle for the UMT, I can't wait to try it. It's no wonder you're exhausted - time to take it a bit easier, maybe? (As if!) 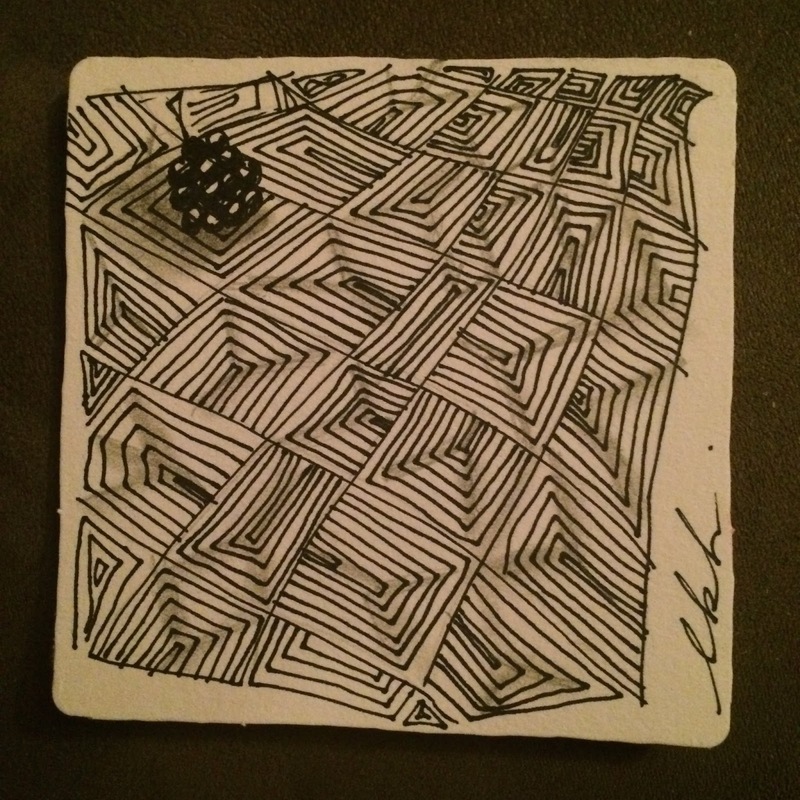 A good challenge and an enjoyable new tangle. Congrats on the 10K! That's an amazing accomplishment! Congratulations on making through the 10K! Thanks for hosting this challenge--it's always interesting. I was first - wheeee! And it's a fun challenge too. As for running 10k - are you mad? Could you not do something easier? Dearie me, I feel tired just thinking about it. Love the variety of options this UMT has. Going to try them all! Congrats on finishing the 10K and your finishing time. The challenge this week is deceptively diabolical for those of us who are perfectionists incapable of achieving perfection. 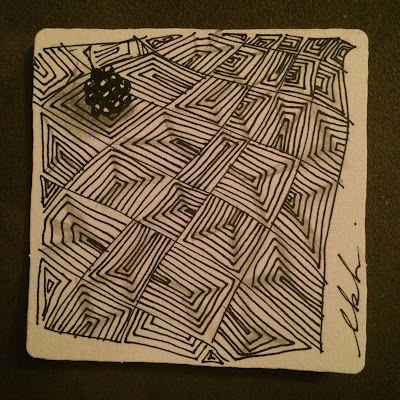 Completely antithetical to the Zentangle spirit, I know. Congratulations on your 10K! I love these challenges. They are so fun! Sounds like you got into the "zone" on your 10K. Congratulations! It's wonderful you finished the 10K! Congratulations! I really enjoyed playing with All Boxed Up. Thank you! Alice's tangle is amazing! I have had LOTS of fun playing with it. Thanks for using it in UMT! And a super big thanks for all your hard work putting this all together for our enjoyment! I had fun with this one. I got kind of sidetracked. It was a new tangle pattern for me and I guess my mind was in a funky place! Congrats on the run! Thanks for all that you do. This was a new pattern for me, and I love it! So many possibilities in just the shading alone! I opted to use it in a monotangle zendala, hope everyone enjoys! Laura, I love your tile, and I think the Bronx Cheer Raspberry compliments it very well! Thanks for introducing 'All Boxed Up' to us. I'm glad that you were finally able to get outside and enjoy the weather. This was the first really warm weather we have had this year too. I think we are finally going to head into summer now. And then I will be regretting that because of the heat...lol. Congrats on the run ... I think it's great that you can do all of that. Looks like you were enjoying yourself. Thanks again for all the work you do here for us and introducing us to all of these wonderful tangles. We really do appreciate you ... hugs! I hope it's not too late to post here. I totally forgot when I finally posted my tiles on my blog last night.